Apollo has no problem with any of them. From his perch in the bedroom window, the little boxer mix, has seen all kinds of wildlife pass through the yard. But there are some things a dog on self-appointed window-guard duty will never get used to. "I woke up to the dog barking and going crazy," Paula Perotte, a councilwoman in Goleta, California, tells The Dodo. "He's very protective. But I've never heard such sounds come out of him." Apollo, a two-and-a-half-year-old boxer mix was at his post in the bedroom window losing his marbles. "I looked over and saw a bear looking in," Perotte recalls. 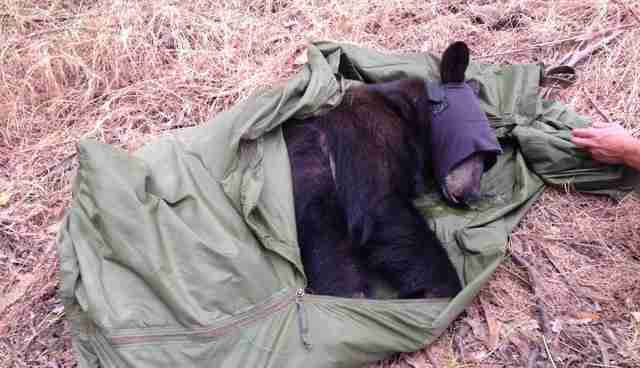 "I kept rubbing my eyes and saying, 'Am I really seeing bear?'" It turns out, Apollo had nothing to be worried about. This bear was a supremely polite guest. "He sat there for quite a while," Perotte says. "He just looked at peace with himself, just sitting in the backyard. Even though the dog was just barking at him." 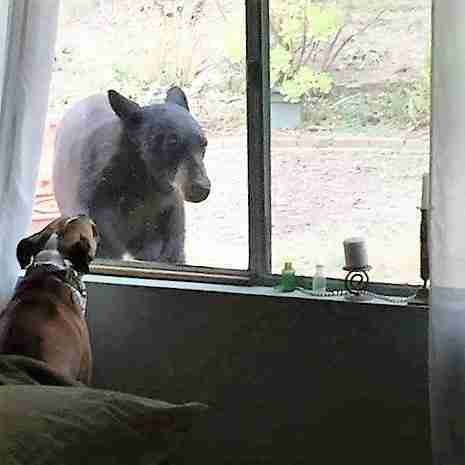 When he finally decided to mosey on, the bear took the utmost care not to disturb a thing. "He got up and gently walked between some lawn furniture," Perotte explains. "He didn't knock anything over. He was very calm. Not aggressive. He's probably looking for food and water. With the drought, they're probably really thirsty." After leading wildlife officials on a chase that went on for four hours, the bear was finally tranquilized and released at another location. But one dog may never be quite the same. A day after Apollo's close encounter with the bear, he's still looking out the window. "Right now, he's looking out the sliding glass door in the family room," Perotte says. "Just looking out. You only can imagine what's going through his mind."